We currently trade at eToro platform. After testing several Binary Options and CFD platforms we find this one to be the most suitable for us. What made the difference is a unique feature that allow us to watch and copy the strategies and trades of the best performing traders on the platform. You can actually see each move the "Guru" traders make. This method works nicely for us. Since we started trading at this broker we noticed an increase of our successful trades and profits when compared to our former brokers. You may want to check them out. Please note that all trading involves risk. Only risk capital you're prepared to lose. Past performance does not guarantee future results. This post is for educational purposes and should not be considered as investment advice. In order to be able to develop an effective binary options trading system you need to understand technical analysis. This guide is design to acquaint you with the basic terms and concepts of technical analysis. So what is Technical Analysis? Basically, technical analysis is the studying of investor behavior as well as its influence on the price action of financial instruments. The primary information which we have to carry out our studies would be the price histories of the instruments, along with time and volume data. All these allow us to make our predictions, depending on objective data. Technical analysis keeps track of and analyzes the ways by which investors behave. This kind of behavior is collectively called sentiment. Technical analysts' viewpoint is that investor sentiment would be the single most important factor in identifying an instrument's price. Technical analysis practitioners believe that this analysis holds the real key to tracking investor sentiment. In technical analysis we use charts to predict asset price movement and develop our strategies, this is why it is extremely important that you will be knowledgeable as to the various charts types that are being used in technical analysis. This is actually the most basic chart format and is produced simply by using a line to join the data points. The most typical use for line charts is for indicators that just have a single daily value (as opposed to high/low) for instance momentum or moving averages. Bar charts use vertical bars to show the price action of the underlying asset for a specific day, it indicates the lower and the higher price for the day. As their name suggests, bar charts use vertical bars to represent price action for that day, drawn from the lowest price to the highest price. Bar charts have indicators for the high and the low price of the asset. The left hand “notch” indicates the opening price of the asset and the right hand “notch” indicates the closing price. Bar charts scales can be modified to show daily, weekly or monthly bars. Candlestick charts offer a more detailed visual representation of bar charts. The opening price is included in the chart and a day's activity would be represented as follows: an up day is indicated by a white (or empty) box. A down day is indicated by a black or shaded box. The "box" shows the open to close range. The "wick" displays the full day's range. Candlestick charts are generally plotted over a one-day period but technical analysts also use weekly and monthly candlestick charts to provide a valuable picture of the longer-term price action. Candlestick charting is one of the oldest methods of technical analysis, with Japanese and Chinese both claiming that rice traders were using candlestick charts over 4000 years ago. Candlestick appeal lies in its ability to give a clear visual representation of the price action during a period, leading to easy-to-recognize pattern recognition. Being familiar with the models of support and resistance is essential in creating a disciplined binary trading strategy. Prices are dynamic, highlighting the ongoing change in the balance between supply and demand. 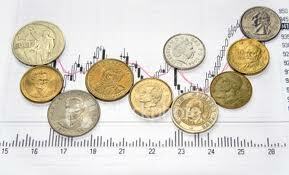 By determining the price levels at which of these balances change we are able to plan the price level where to buy. Even though these levels could be created by the markets subconsciously they signify the collective views of the individuals in the markets. Support represents the level where buying pressure is powerful enough to absorb and overcome the selling pressure. At price support levels buyers move into the market mopping up the imbalance between supply (sellers) and demand (buyers) so that when this happens the price will stop its fall and may probably rise. Resistance is the opposite of support and is the level where the volume of selling (supply) exceeds the volume of buying (demand). These mini-levels may change frequently but over time a visible pattern comes out and firm levels come to be set up. We all know that prices do not rise or fall in a straight line but rather move in a series of zigzags which resembled waves. Now, the relative positioning of the peaks and troughs in these waves define the trend. For a stock to be in an uptrend, it must make successive higher peaks (highs) and higher troughs (lows). For a stock to be in a downtrend, it must make lower peaks (highs) and lower troughs (lows). Simply by figuring out these types of peaks and troughs, we are able not just to explain the present trend and set it in its historic framework but, equally as important, figure out when it is changing. We do this by looking at the patterns created by the peaks and troughs. The moving average is probably the most widely used indicator and is used by technical analysts for numerous sorts of tasks. Moving averages can be used to discover regions of short term support/resistance, to look for the current trend and as a component in numerous other indicators like the MACD, or Bollinger bands. The primary benefits of moving averages is first of all that they smooth the data and therefore offer a sharper visible picture of the present trend and subsequently, that moving average signals can provide an accurate answer as to what the trend is. The primary downside is that they are lagging rather than leading indicators. The simple moving average calculates the average price over a specific moving time period. For example, a 50 day simple moving average will calculate the average mean price from the last 50 days closing prices.. The exponential moving average also averages the last x days closes but designates a greater weight to the more recent prices which makes it more sensitive to present price action thereby decreasing the lag impact. Sidebar: you are invited to visit our car insurance information section featuring a list of articles that may save you hundreds of dollars on your motor vehicles quotes. In full coverage auto insurance you'll discover helpful tips to getting cheap quotes. For information on how to get cheaper quotes on shorter terms see one month car insurance and also short term car insurance. For first time drivers information see cheap car insurance for new drivers. How about obtaining cheaper premium rates for mature women? no problem, look here, best insurance for new drivers over 25 year olds. If you are interested in a half year duration see 6 month car insurance for helpful tips on the topic. How about getting more favorable premiums costs for younger drivers? see car insurance for 17 year olds and motor car insurance for under 21 and vehicle insurance for male and female under 25 years old. Here is another list of drivers insurance useful articles, As for helpful tips regarding no deposit premium payments see car insurance with no deposit and for a list of low cost brokers, agents and companies see car insurance with no deposit companies. Read the following informative article if you are looking for better rates for the young drivers in your family, cheaper vehicle insurance for young drivers. Now, for discovering new ways to get lower quotes go to general car insurance Read this article if your after high risk car insurance information. How about getting a better deal on first time driver? just click the link. It may come a time that you'll be interested in canceling your policy, use this article for the instruction of how to do it. Our drivers insurance hub page features a list of guides that can surely help you get dirt cheap car insurance for teens drivers rates. For those of you who seek cheap quotes for a shorter term policy, read this article. and here are tips and advice for special interest groups such as young drivers and temporary insurance. If you have first drivers in your family look here for useful advice regarding cheap drivers first car insurance on getting very very cheap car insurance quotes, other types of policies can include the following: no deposit car insurance, pay monthly, insuring classic cars for young drivers, getting better deal on cheap liability car insurance cost, locating good rates for new drivers. how about if you are interested in pay as you go auto insurance? yep there is a guide for you. And here is a list of car insurance companies cheapest. And the list concludes with a way to calculate car insurance estimate without personal information. Disclaimer: While every effort is made to ensure that the content of this website is accurate, the website is provided “as is” and Bizmove.com makes no representations or warranties in relation to the accuracy or completeness of the information found on it. While the content of this site is provided in good faith, we do not warrant that the information will be kept up to date, be true and not misleading, or that this site will always (or ever) be available for use. Nothing on this website should be taken to constitute professional advice or a formal recommendation and we exclude all representations and warranties relating to the content and use of this site. Copyright © by Bizmove Binary Options Trading Center. All rights reserved.